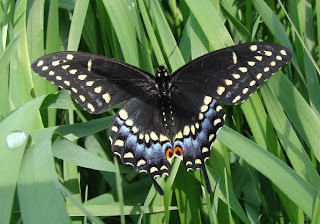 Our first brush with officialdom today was this female Black Swallowtail butterfly that Mike spotted in the barnyard. It's been the official State Butterfly for Oklahoma since 1996. I notice that Oklahoma even has a state beverage: milk. This is also the sole state beverage for 15 other states. Does that seem a bit odd to anyone else? Ontario's list of official emblems is somewhat shorter than Oklahoma's, although I'm dubious about the need for the Act establishing an official tartan - maybe 2000 was a quiet year for law-makers in the province. 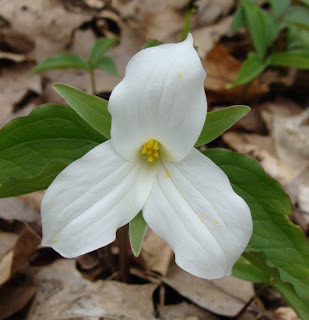 Anyway, the official flower for Ontario is the white trillium (trillium grandiflorum) and there were lots of them flowering in Presqu'ile Provincial Park this afternoon when we went out for our Mother's Day walk. We'd never seen them before - they are beautiful. I love trillium. After a few days they start to turn a light shade of pink. Beautiful trilliums and such a joy to discover a wild patch on a walk. Lucy you spotting the butterfly already. These flowers look very much like Dogwood, related? They're not related, but you're right, they do look very similar (and grow in similar habitats). The Canada Dogwood has one of the fastest pollen explosions of all plants - there's a whole website with amazing footage of it at http://www.williams.edu/Biology/explodingflower/index.html.